This tutorial demonstrates how you can use SQLite in your Android application to build a list of high scores. Why Use SQLite in your Android App? SQLite can be a powerful tool that makes it easy to store, access, and manipulate data. 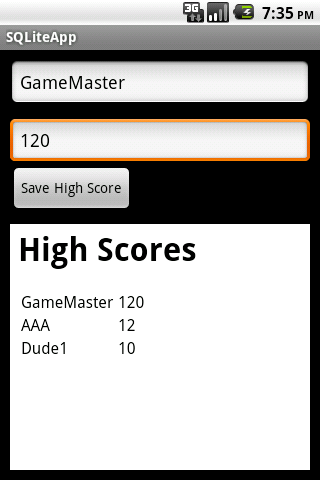 Say that you have designed a game for Android, and you would like to keep track of the user's high scores for the game. You could store the high scores in an SQLite database, and retrieve the scores sorted from highest to lowest to display to the user. I should also note that some basic understanding of SQL would be helpful when reading this tutorial. We are going to build a simple app that will allow us to test using SQLite to store and retrieve our list of high scores. 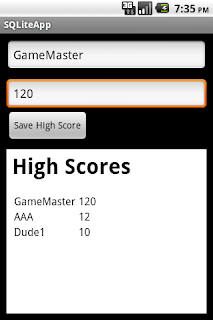 Our app must allow us to easily add new scores and easily retrieve the list of high scores. Our app will include an text input and a corresponding button to add a new high score, and a webview to display the highscores. The webview will refresh whenever a new highscore has been added. The first text input will contain the name of the player for the high score. The second text input will contain the score. The complete XML code for the layout is pasted below. First, we must make sure that we have an SQLite database set up. Then we need to make sure that we have a table set up to store the high score entries. Before we go about doing that, we want to create a set of constants to use when referencing the database. These constants are listed below. We want the table to be able to hold two pieces of information, a name and a score. In our onResume method, we are going to open the database, and create the tables if necessary. This code is listed below. We want to add data when the "Save High Score" button is clicked. To do this, we will add an onclick listener to this button. Inside the onClick method, we will want to validate the data before we add it to the database. We want to make sure that the inputted score is a valid integer. The code below accomplishes this. Now that we have validated the data, we are ready to add it to the database. This is accomplished by making a map with the keys being the column names and the values being what you want to store. After storing the specific entry, we want to retrieve all the high scores. We do this by getting a cursor object. Using the cursor we can iterate over the results. This code will retrieve the columns COLUMN_NAME and COLUMN_SCORE from the HIGH_SCORE_TABLE and sort based on COLUMN_SCORE. Now that our query has been executed, we will loop from the end of the data back to the beginning. As we loop over the data we will use a StringBuilder to create a simple string of HTML to display the data. Once the string of data has been built, we can display it in the WebView. The code to do this is pasted below. After we are done using the cursor, we should close it. We should also close the database itself when we are not using. You could close it in the onPause method of your activity. Below is a screenshot of what the app looks like when it is working. 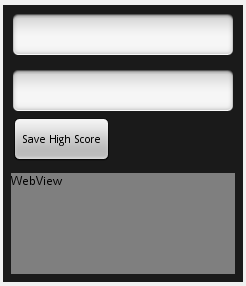 Screenshot of the application with some high scores added. The full code for the Android application is pasted below. 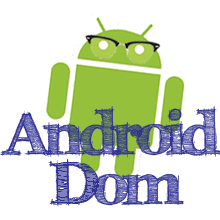 This tutorial was designed to introduce you to SQLite on Android. If you would like to share this SQLite data among different applications, then you must create a full content provider. This is more complex and will be featured in a later tutorial. Please leave any feedback in the comments. Thanks! Thanks. I let this blog kind of get stale for a while so it is my goal (at least for the next month) to provide a lot more tutorials. So thanks for the comments and keep checking for updates. How you do pull from the database to a ListView with 2 columns? also helped me to complete my task. I have one doubt in this app? We are setting the high score by just typing that in a text box. Can't we get the score from the game and check whether it is a new/ high score or not, then going to high score screen and write the name who scored so and so, as the score should be already added and say OK.
can you give source code please ? It would be nice if everyone who publishes tutorials would do this one simple thing, document the code , document it like a book. remember we don't know most of the commands ,etc, yet. And when they provide downloadable document that to.